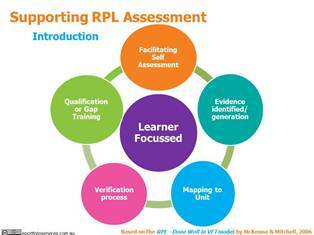 Eportfolios can offer a robust process for supporting the recognition of prior learning (RPL) assessment process, when based on the “RPL Done Well in VET” model (McKenna & Mitchell, 2006). All of which is uploaded as evidence into their eportfolio. Additional evidence, such as work reports, workplace examples, reports etc, can be either uploaded into or created in the eportfolio. By ‘tagging’ or adding “key words” to each piece of evidence or ‘artefact’, candidates can easily aggregate their evidence around a particular Unit code or theme. This allows a piece of evidence to be uploaded once and then ‘tagged’ with the Unit codes/key words they relate to. The ‘tag’ can then be ‘searched’, and the eportfolio system will aggregate together any artefacts which has this Unit Code attached them. This allows evidence to be quickly pulled other to demonstrate whether the candidate has the right evidence to be assessed as competent for that Unit. Candidates can copy an ‘RPL mapping tool’ template prepared by the RPL assessor from within the eportfolio system into their own eportfolio, which they can then add their existing and generated evidence into the appropriate spaces within the template. To support the verification process, third parties, such as supervisors and employers, can add comments on artefacts within the candidate’s eportfolio to verify that the evidence is their own work. Final copies of the candidate’s eportfolio can be submitted to the RPL assessor, and then locked and kept for auditing purposes. If the candidate is successful in gaining RPL, electronically issuing a digitally signed and/or encrypted Parchment or Statement of Attainment means the candidate can include this document as part of their eportfolio for future use (see step 7 below). If gap training is required, the candidate can use their eportfolio to help plan and manage their personal or individual learning plan. They can serve as an excellent lifelong learning support tool.